» review: limecrime velvetines in ☠"black velvet"☠. » review: limecrime eyeliner in ☾"lunar sea"☽. » review: forever21 gel eyeliner in "brown". » review: makeup geek gel liner in ☢"poison"☢. » review: forever21 eyebrow kit in "LIGHT 900". 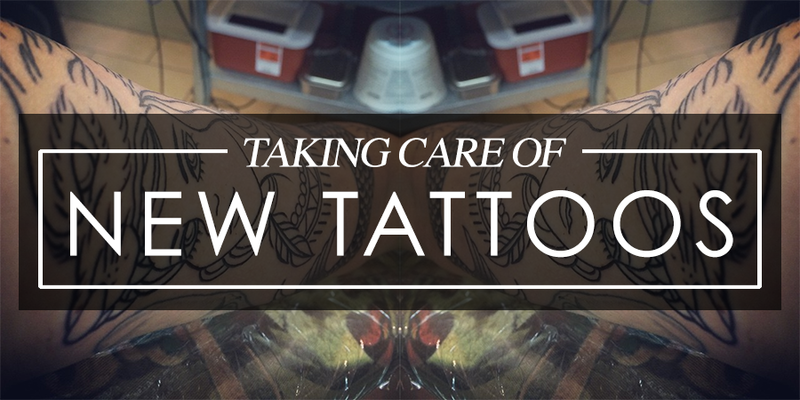 tips: taking care of (new) tattoos. i hope you all had a wonderful christmas and a happy new year, and for those of you who don't celebrate either of those, i hope you all had a wonderful day! anyway, those of you who know me url and irl, know that i love tattoos. i have been getting tattoos the moment i turned 18. and currently, i have 14 tattoos on my body and i love every single one of them. all of my tattoos are done in black ink; i have no colored tattoos. however, black ink will still fade and a couple of my older tattoos are starting to lose a bit of their color and they need to be touched up real soon. • wait at least 2-24 hours to clean a new tattoo. don't remove the wrapping that the tattoo artist has put on you. this will give your skin a bit to heal and all the blood will stop running. then, clean your tattoo with cold/lukewarm water with antibacterial soap. • clean your tattoo at least 3 times a day. again, clean your tattoo with cold/lukewarm water with antibacterial soap. use your hands. avoid towels or scrubs because they can be too harsh on your skin. even if you're in the shower/bath--use only your hands! also, this is redundant, but make sure you're not allergic to the soap either. i used bath and body works antibacterial soap and it turned out that i was allergic to it, haha. • once your tattoo is cleaned, apply a thin layer of ointment. usually, if you ask your tattoo artist, they'll provide a little package or two of a&d ointment for you. or you could buy some. anyway, apply the ointment and blot off any access with a paper towel until there is no shine using light tapping motions. • let your tattoo breathe. avoid tight clothes. give your tattoo a little bit of air to help it heal. this is a problem for me, haha;;; when your tattoo is healing it will start to peel and flake of your skin. this process while make you want to scratch, but don't do it! don't let satan win!! if you must scratch, slap your skin instead. yes, hit yourself. the impact will send a small wave of relief, and your nails won't tear at your healing skin! • use lotion for about a week once your tattoo is free from peeling. this will sooth your irritated skin. nuetrogena, curel, and jergens are all good choices. • apply sunblock when going out. the sun rays will cause the ink to fade faster. plus, sunscreen is good for your skin, so it's a win-win. make sure you do this especially during the summertime, when the sun is especially harsh. • avoid sunbathing and tanning beds. again, the sun will make your tattoo to deteriorate in color. keep your skin from drying out, especially near tattooed area. apply lotion whenever your skin starts getting dry and flaky. dry skin may make you itchy, but again, don't scratch!! • know that your tattoo will still fade within time. and thats it! i really hope this helps some of you with your new ink!